I had only very few brinjals leftover after I made the brinjal curry (with garlic) last week and I was really bored of my usual cooking – sambar – poriyal, etc; etc;. And I ran out of the regular eating rice too. I was thinking what to make and suddenly thought of making vaangi bhaat. I didnt want to waste those brinjals or make sambar with it. And was worried if Vj would eat or not. So I added on the lemon rice to the menu. I had very little regular eating rice, so made curd rice with it. But to my surprise, Vj loved the brinjal rice more than lemon rice, coz it turned out super delicious and spicy. Needless to say, I love, loved the whole meals. I always love variety rice over the regular sambar sadam. Its easy to cook and break from the routine cooking too. Let me write how I prepared this lunch menu. I used India gate aged rice. It gives longest grain and flavorful too. I soaked it for an hour in warm water. Cooked it in electric rice cooker. Pressure cook the regular rice for curd rice, cool down that as well. I used half the basmati rice for vaangi bath and half for lemon rice. Grate coconut. Keep all the ingredients required for everything, like curry leaves, coriander leaves, green chillies, cut brinjal and keep immersed in water. Roast for vaangi bhaat. Cool down. Temper for curd rice, transfer to a container in which you are going to mix it. Temper for lemon rice and transfer to another bowl in which you are going to mix lemon rice. Lastly temper for vaangi bath. Grind the vaangi bath masala powder and finish preparing the masala. By now both rice would have been done, cool down and carefully separate the grains and mash the rice for curd rice. 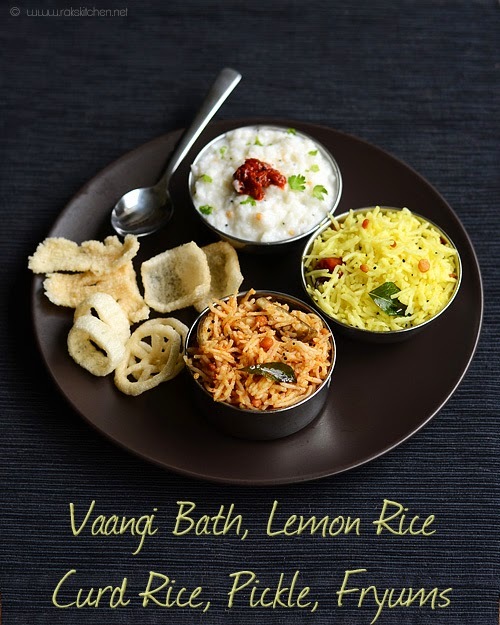 Mix vaangi bath first, then mix lemon rice and lastly curd rice. Finally fry some vadams or fryums or appalams. Here is the lunch with vaangi bhaat, lemon rice,curd rice, fryums and pickle. Pls pass the plate…colorful and tempting clicks..
i asked a doubt abt ur raspberry cheese cake, could u pls clear those doubt??????? ?